eDepartment of Neurological Sciences (I.R.F.d.S. ), Rush University Medical Center, Chicago, Illinois. SUMMARY: When the first suspected cases of neurologic disorders associated with the Zika virus were noticed in Brazil in late 2015, several studies had been conducted to understand the pathophysiology of the disease and its associated complications. In addition to its well-established association with microcephaly in neonates, the Zika virus infection has also been suggested to trigger other severe neurologic complications in adults, such as Guillain-Barré syndrome, radiculomyelitis, and meningoencephalitis. Hence, the Zika virus should be deemed a global threat that can cause devastating neurologic complications among individuals in all age ranges. The aim of this review was to further describe neuroimaging findings of Zika virus infection and associated neurologic complications found in adults. MR imaging plays a key role in assessing the CNS and is, therefore, recommended for the diagnosis and follow-up of patients infected by the ZIKV. MR imaging involves no ionizing radiation and has the advantage of greater tissue differentiation, allowing a better evaluation of the CNS and providing useful data for eventual differential diagnoses. The aim of this study was to describe the MR imaging findings of neurologic disorders in adult patients with ZIKV infection. The major vector of ZIKV worldwide is the mosquito Aedes aegypti, followed by Aedes albopictus. However, due to widespread distribution, the virus has been recently isolated from other mosquitoes, including the Aedes furcifer, Aedes vittatus, Aedes taylori, and Aedes hirsutus. The ZIKV is primarily transmitted between individuals through infected mosquito bites, establishing a transmission cycle between humans and mosquitoes. The transmission sources of ZIKV described so far are mosquito bites and human-to-human transmission (via body fluids). It is extremely difficult to differentiate solely on the basis of clinical grounds the acute infections caused by ZIKV, DENV, and chikungunya virus. All of them might present in most patients with an acute exanthematous fever, usually associated with a maculopapular skin rash, conjunctivitis, and a painful syndrome, normally comprising headache, myalgia, and arthralgia, with subtle differences in the presentation.7 The rash might be more prominent with ZIKV, whereas DENV leads to more pronounced headaches and generalized pain, with chikungunya virus frequently causing incapacitating arthralgia and/or arthritis.7 Thus, laboratory diagnosis is essential during an outbreak of arbovirosis, even more so in places with endemic cases. Since the ZIKV infection has become a global health problem, the World Health Organization has published several algorithms for an accurate diagnosis of the disease.13 The criterion standard for laboratory diagnosis of ZIKV infection relies mostly on the demonstration of the virus in body fluids by real-time reverse-transcription polymerase chain reaction analysis to detect the viral RNA; however, its positivity is very transient, usually persisting no longer than 5–7 days in the blood and CSF.14 Some studies have suggested a prolonged positivity in urine8 and semen15 for a few weeks to months. Guillain-Barré syndrome is an acute, immune-mediated polyneuropathy affecting mainly the peripheral nerves and often following a prior infection. Several reports have described a probable, temporal association between the exponential increase in the number of GBS cases and ZIKV infection in areas of recent ZIKV outbreaks.5,8,17,21 Other arboviruses, especially the dengue and chikungunya viruses, have also been associated with an increased incidence of GBS in previous studies. MR imaging is mainly performed to rule out other clinical conditions presenting with acute flaccid paralysis. 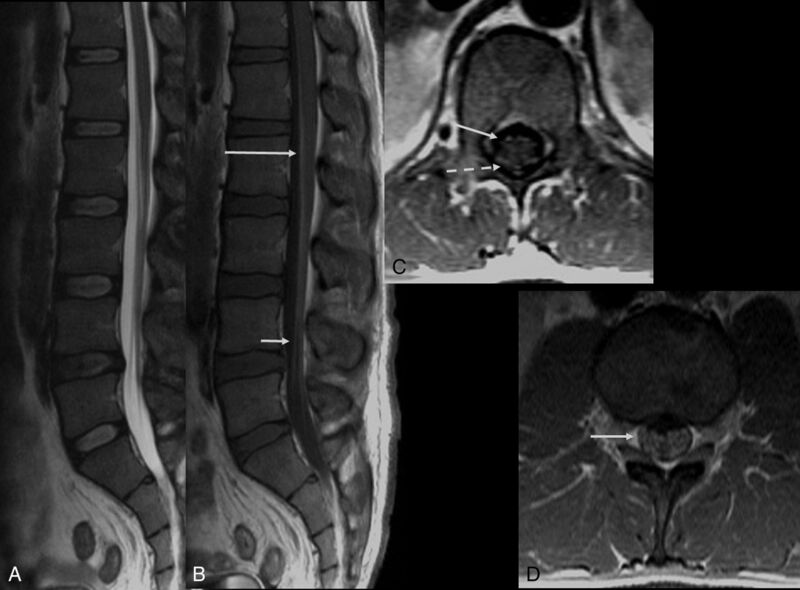 The findings on MR imaging are like those described in classic GBS, and nerve root enhancement of the cauda equina is often seen in postgadolinium T1-weighted imaging sequences. The involvement of the posterior nerve roots is commonly observed. However, in several cases, diffuse nerve root enhancement may also be observed (Fig 1). Spine MR imaging may also reveal bilateral abnormalities in the lumbar spinal ganglia, characterized by increased signal intensity in T2-weighted images and contrast enhancement. In addition, postcontrast enhancement of cranial nerves may also be noticeable, particularly in the facial and trigeminal nerves (Fig 2). Guillain-Barré syndrome in a patient with Zika virus infection. Spine MR imaging of a 35-year-old man with progressive ascending paralysis. The conus medullaris and cauda equina nerve roots appear normal on the sagittal T2-weighted image (A). Postcontrast enhancement is noted in the conus medullaris (long arrow) and cauda equina nerve roots (short arrow) following the injection of a gadolinium-based contrast agent in the sagittal T1-weighted image (B). Postgadolinium axial T1-weighted image demonstrates enhancement in both anterior (solid arrow) and posterior (dashed arrow) nerve roots (C) as well as in the nerve roots of the cauda equina (D, arrow). A 30-year-old woman with Zika virus infection with Guillain-Barré syndrome. Postcontrast sagittal T1-weighted image demonstrates enhancement in the cauda equina nerve roots (long arrow) and lumbar spine ganglia bilaterally (short arrows) following injection with a gadolinium-based contrast agent (A). 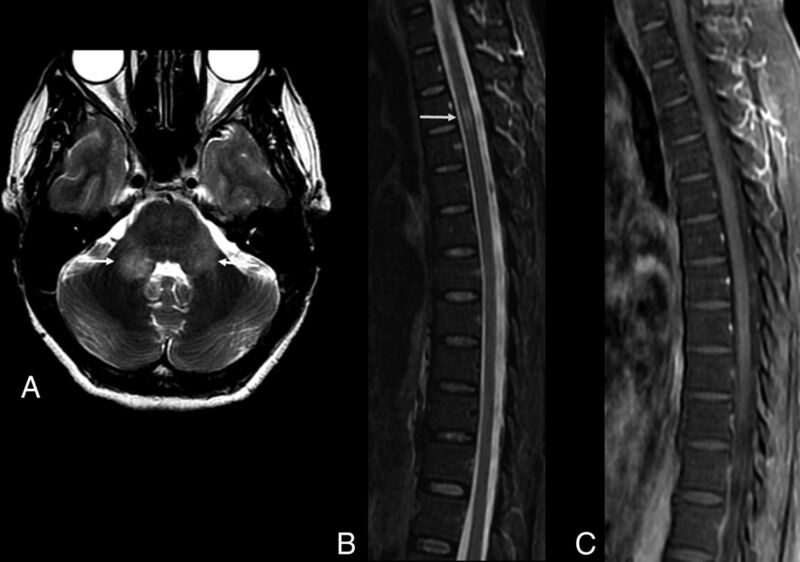 Axial postcontrast, fat-suppressed T1-weighted MR imaging shows gadolinium enhancement of the facial nerves (B, arrows). Axial postcontrast, fat-suppressed T1-weighted MR imaging shows gadolinium enhancement of the trigeminal nerves (C, arrows). Despite the current absence of definitive evidence of an association between myelitis and ZIKV infection, a few reports have suggested that this association is likely to occur. Flaviviruses are neurotropic viruses, and DENV, Japanese encephalitis virus, and West Nile virus infections are often related to the occurrence of extensive transverse and longitudinal myelitis.26 Clinically, patients with these infections often present with fast-developing acute flaccid paralysis. Spine MR imaging of a 35-year-old man with Zika virus infection and Guillain-Barré syndrome presenting with progressive ascending paralysis that evolved to respiratory distress and decreased level of consciousness. The patient had skin rashes preceded by flulike symptoms 1 week before the development of neurologic symptoms. 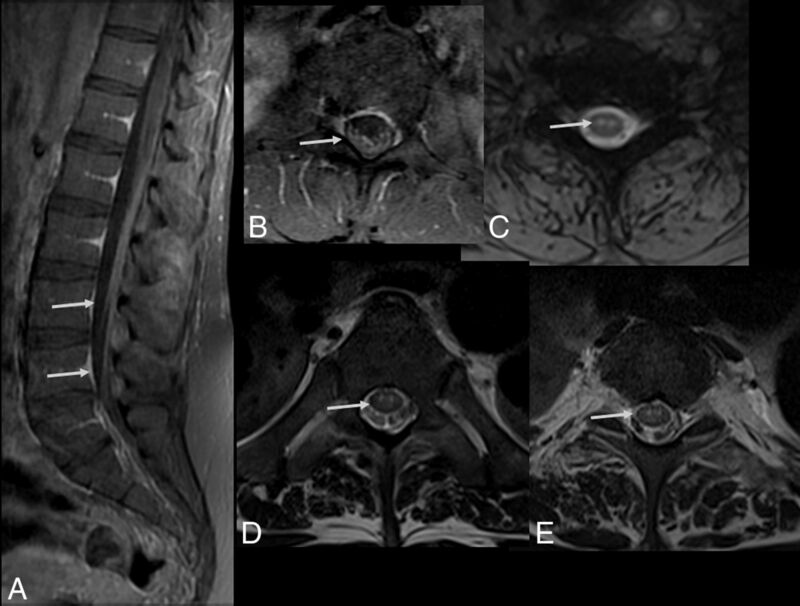 Postcontrast enhancement is seen in the cauda equina nerve roots (arrows) on sagittal (A) and axial (B) T1-weighted spine images following gadolinium-based contrast agent injection. Axial gradient-echo T2-weighted (C) and FSE T2-weighted (D and E) spine images reveal hyperintensity (arrow) in the anterior horns of the cervical (C) and thoracic spinal cord (D). Acute myelitis in a patient with Zika virus infection. Spine MR imaging of a 38-year-old woman with unsteadiness and weakness in the lower limbs. Hyperintense, ill-defined lesions are seen in sagittal (A, arrows) and axial (C and D, arrows) T2-weighted images of the cervicothoracic and middle thoracic spinal cord, causing mild expansion of the cord (A). The lesions demonstrate contrast enhancement in the postgadolinium sagittal T1-weighted image (B, arrows). Meningoencephalitis is a well-known and common presentation of Japanese encephalitis29 and West Nile virus infections,26 but it is, surprisingly, a relatively rare complication involving other flaviviruses, including the ZIKV.30,31 The patients affected with meningoencephalitis present clinically with progressive somnolence, seizures, and focal deficits, and in rare cases, their condition may evolve into deep coma or brain death. As demonstrated in previous studies, cases of viral encephalitis (irrespective of the causing agent) may show no abnormalities on imaging examinations. Among a few available reports of ZIKV infection, no specific neuroimaging pattern has been found suggesting the occurrence of this condition. 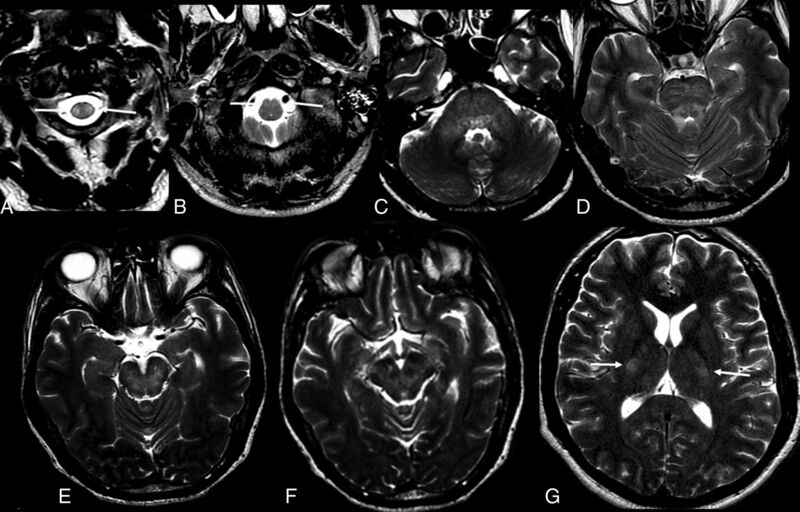 Previous reports have revealed the presence of asymmetric subcortical hyperintense lesions in meningoencephalitis, which may show restricted diffusion.28 Japanese encephalitis and West Nile viruses more commonly affect the deep gray matter, brain stem, and cerebellum; in contrast, a recent report has shown the involvement of the cortical and subcortical junctions, particularly the cingulate and superior frontal gyri.28 Cortical lesions in other infections by flaviviruses have also been demonstrated but are less frequent. In another study, diffuse and confluent lesions in the basal ganglia, thalamus, and white matter have been related to ZIKV infection–related encephalitis.31 Some patients may also present with bilaterally increased signal intensity in the middle cerebellar peduncles and corticospinal tracts (Fig 5). Other patients have been shown to present with brain stem involvement characterizing rhombencephalitis (Figs 6 and 7). The same patient as in Fig 3. Zika virus-related Guillain-Barré syndrome associated with brain stem encephalitis and myelitis (encephaloradiculomyelitis). Brain MR imaging of a 35-year-old man positive for Zika infection with Guillain-Barré syndrome who presented with progressive ascending paralysis evolving to respiratory distress and decreased level of consciousness. The patient had skin rashes preceded by flulike symptoms 1 week before the development of neurologic symptoms. Axial and coronal T2-weighted brain images show bilateral hyperintensity (arrows) in the middle cerebellar peduncles (A) and corticospinal tracts bilaterally (B and C). Brain and spine MR imaging performed 2 months after treatment demonstrate improvement of the middle cerebellar peduncle and corticospinal tract hyperintensity (D and E). An absence of contrast enhancement is seen in the conus medullaris and cauda equina nerve roots in the postcontrast sagittal fat-suppressed T1-weighted image (F). Axial T2-weighted spine image reveals improvement of the hyperintensity in the anterior horns of the thoracic spinal cord (G). 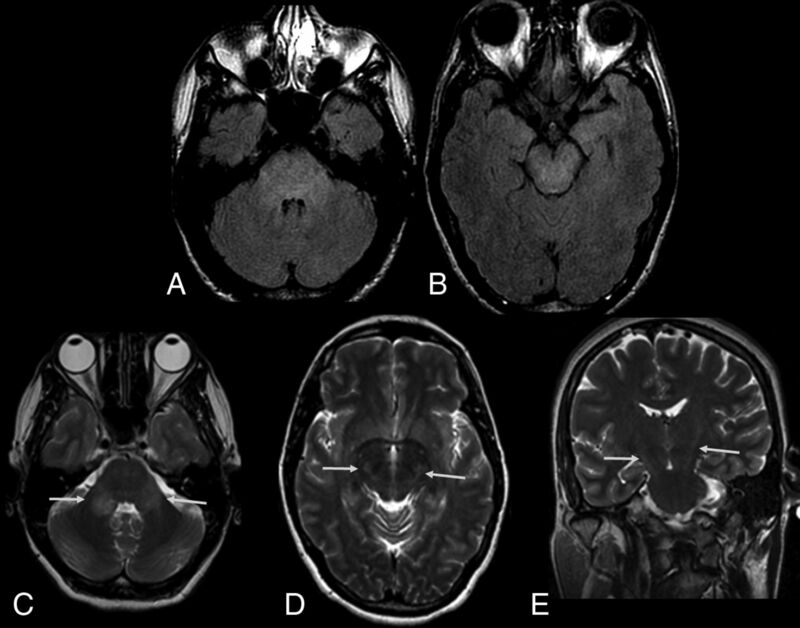 Zika virus–related brain stem encephalitis in a 40-year-old man. Axial fluid-attenuated inversion recovery image shows diffuse hyperintensity in the brain stem, especially in the pons and cerebral peduncle (A and B). 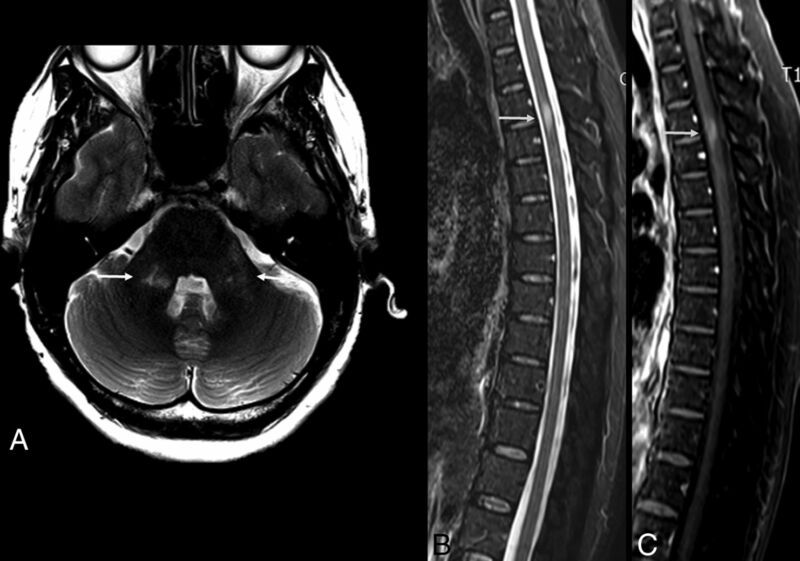 Axial T2-weighted images show bilateral hyperintensity in the middle cerebellar peduncles (C, arrows). Hyperintensity is also seen in the corticospinal tracts bilaterally in axial (D) and coronal (E) T2-weighted images. These lesions showed no enhancement on postcontrast T1-weighted images (not shown). 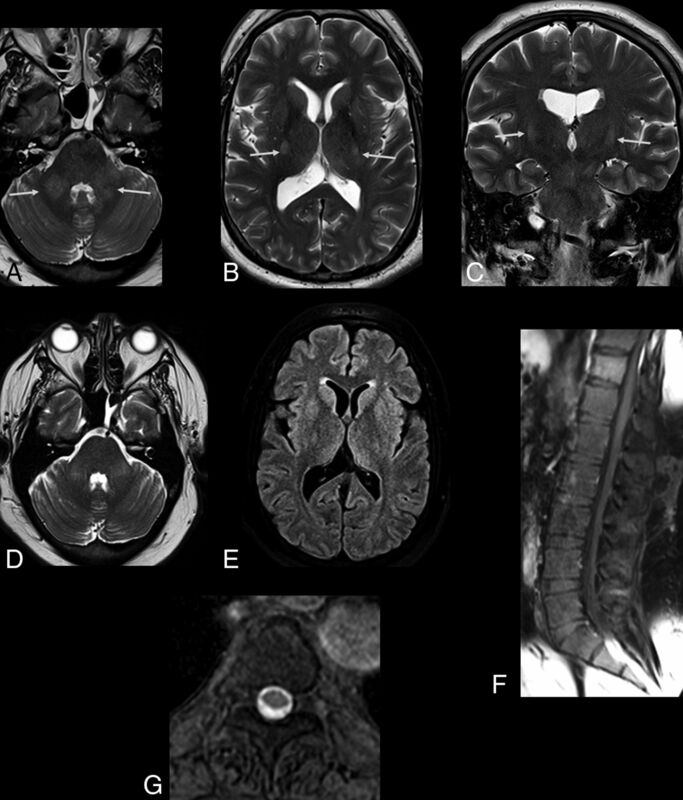 Axial T2-weighted images of a 52-year-old man with Zika virus–related brain stem encephalitis and myelitis. Hyperintense lesions are seen in the upper portion of the lateral columns of the cervical spine (A, arrow) and anterior portion of the medulla bilaterally (B, arrow). The brain stem is diffusively involved (C–G), as are the middle cerebellar peduncles (C) and the bilateral corticospinal tracts (G, arrows). Acute disseminated encephalomyelitis is an immune-mediated inflammatory demyelinating disorder targeting mostly the white matter of the brain and, less frequently, the gray matter and the spinal cord. It is characterized by an acute or subacute encephalopathy with multiple neurologic deficits and is typically monophasic and self-limiting. Although infrequent, recurrent and multiphasic forms may also occur. Clinical symptom onset generally develops within 3 weeks after a viral infection or vaccination. However, in some cases, it is not possible to prove such a relationship. The diagnosis is based on clinical and imaging findings, as well as on excluding other conditions that can mimic ADEM. Although it can occur at any age, it is more common in children and young adults. Similar to observations of other viral infections, ZIKV infection may also be related to ADEM.32,33 The imaging findings described are like those observed in other related causes of ADEM, such as multifocal and asymmetric lesions, affecting the brain and the spinal cord. The clinical course of ADEM-ZIKV cases was very similar to that of the most typical ADEM cases, characterized as a self-limited and monophasic course, appearing weeks after the viral infection. MR imaging findings reveal multiple ill-defined, asymmetric, hyperintense lesions on T2-weighted and FLAIR images (Fig 8), which demonstrate contrast enhancement in T1-weighted postgadolinium images.28 Figure 9 shows follow-up MR imaging performed 2 weeks after the infection. Brain and spine MR imaging of a 48-year-old woman with Zika virus infection and encephalitis and myelitis. Axial T2-weighted image of the brain shows hyperintensity of the middle cerebellar peduncles bilaterally (A, arrows). Short tau inversion recovery sagittal image (B) demonstrates a hyperintense lesion in the upper portion of the anterior spine without enhancement in the sagittal postcontrast T1-weighted image (C). Follow-up MR imaging was performed 2 weeks later. The same patient as in Fig 8. Follow-up scans (2 weeks after infection) of the brain and spine MR imaging of a 48-year-old woman with Zika virus infection and encephalitis and myelitis. Improvement of the cerebellar lesions is seen (A, arrows). However, the anterior spinal cord is enlarged (B, arrow) and shows contrast enhancement (C, arrow). Some MR imaging findings in ZIKV infection have an appearance like that of other flavivirus infections. The West Nile virus may also present with abnormalities resembling the ones described in ZIKV infections. 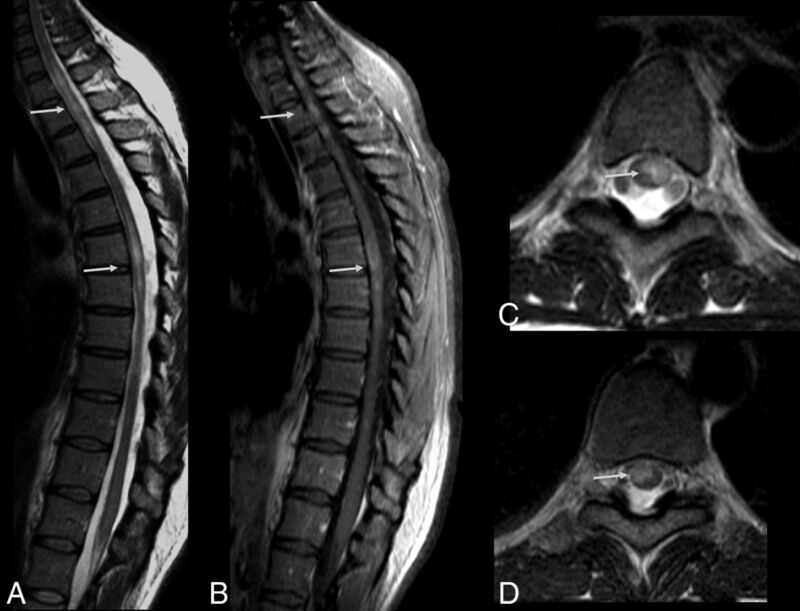 Previous reports have demonstrated increased signal intensity in both the middle cerebellar peduncle and anterior horns of the spinal cord, as well as contrast enhancement of the lumbosacral nerve roots.26 These imaging features are identical to those observed in some cases of ZIKV infection.17,26 The same pattern may be observed in patients infected with the Japanese encephalitis virus.29 On the other hand, in this particular presentation of patients infected with ZIKV, a slight hyperintensity in bilateral cortical spinal tracts may also be seen (Figs 5⇑–7). Thus, the differential diagnosis of the entities presenting with the imaging findings described above may only be established with further laboratory analysis. Nerve root enhancement seems to be the most common imaging finding related to ZIKV infection, while it has also been reported that involvement of the lumbosacral nerve roots is mostly related to GBS.8,17 In our opinion, the posterior nerve roots are equally involved in ZIKV infection, as are the anterior nerve roots. However, the anterior nerve roots are preferentially involved in GBS. In endemic areas, the identification of diffuse involvement of the cauda equina may be used to suggest the diagnosis of ZIKV. In addition to the extensive congenital abnormalities previously described, ZIKV may be associated with a substantially increased incidence of a broad spectrum of life-threatening neurologic syndromes in adults. Unfortunately, no specific neuroimaging finding can be related to this viral infection. In addition, some observed abnormalities are very similar to those seen in other flavivirus infections. However, in combination with clinical information, neuroimaging can be used to suggest the possibility of ZIKV infection, especially in endemic areas. Thus, the MR imaging findings of these neurologic syndromes, in association with serum and CSF analysis as well as molecular and serologic testing, may play a significant role in the diagnosis of ZIKV infection. This work was supported by the Conselho Nacional de Desenvolvimento e Pesquisa and Fundação de Amparo à Pesquisa do Estado do Rio de Janeiro.